Isotec’s makes two types of Commercial Single Lane Safety Entrances. The more common is our uni-directional entrance, whereby both doors open toward or into the lobby. However, in a drive for overall cost savings, more sites are now requesting bi-directional single lane entrances, that can avoid the need for a separately dedicated exit lane. This is important where interior and storefront space is limited. By NFPA standards, our uni-directional entrance doors that only open toward and into the building, may not meet emergency exit requirements. Depending on the building’s occupancy rating, the directional door swings may not meet fire codes. Our bi-directional door entrance has met and passed related NFPA fire code inspections. The one key difference between the two is the bi-directional entrance’s lobby door can swing into the lobby for people entering the building and swing in the direction of egress for people leaving the building. This entrance complies with the emergency exit fire code requirement that doors swing outward in the direction of egress. 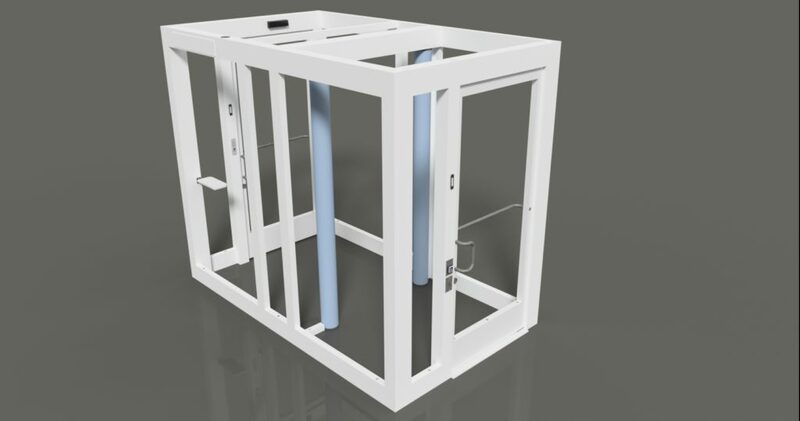 To learn more about our patented security vestibules, or to schedule a free consultation call 303.974.7699 or contact our Sales Director Matt at msamels@isotecinc.com today. The bi-directional entrance door is secured by a 1200lb shear lock in the door’s frame vs. being mounted overhead. The door’s closer has a centering mechanism that, regardless of direction drives the door toward the magnetic bonding point of the shear lock. In the event of fire or emergency, the power to the magnetic locks for the entrance is cut, enabling both doors free to swing outward in the direction of egress. The bi-directional door entrance cannot have power assist features or automatic door openers on the lobby door. This is due to the 180-degree range of movement required for door operation. Manufacturers don’t make auto closers with a 180-degree range of motion. Standard auto door closers usually operate in one direction with a maximum 90-degree range of motion. Isotec’s uni-directional single lane entrance can be equipped with power assist features and automatic door openers. The cost of the bi-directional entrance is generally $4,000 – $5,000 more than our uni-directional single lane entrance. However, since the bi-directional entrance avoids the need for a two-lane entrance, the overall product and installation cost savings can be greater $15,000 – $20,000 vs. a two-lane entrance. Both of our Commercial Single Lane Safety Entrances have approach and presence sensors that transmit signals to the logic controller. The controller then determines whether to operate in “Entry” mode or “Exit” mode. This is important for passages can only occur in one direction per occupant. The default setting for both versions is to operate in “Exit” mode as egress retains priority over entrance. When approached from the outside the controller operates the entrance to meet weapons detection, tailgating, or access control modes. When approached from the lobby side the controller operates in exit mode which, depending on the security protocol, may include deactivating the metal detector. The bi-directional and uni-directional entrances are controlled by Isotec’s Synergy operating system. The operator’s touchscreens can either hard wired or wireless to enable operator mobility. Get in touch with us today at 303.974.7699 or contact our Sales Director Matt at msamels@isotecinc.com for a free estimate on single lane safety entrance.